Our larger PRO XL model features a 20 HP V-Twin engine that provides the muscle you need to take down 3” thick saplings and the thickest field grass with ease. Power Steering makes it easy to turn the 30" deck. Twin-Cylinder Power AND Power Steering! If you love power to spare in your equipment, you'll have more than enough with our new PRO XL30, 20.0 HP model. This baby rocks a V-Twin Briggs Professional Series engine that delivers a massive 650cc of power to the extra-wide 30" mowing deck. This model is great for cutting extra tall and dense growth down to size with ease. And, as with all of our 30" and 34" models (that have extra power, weight, and width), the PRO XL30 also features disc brakes for maximum traction on side slopes, as well as Power Steering for turning and maneuvering these larger machines. 30" brush deck cuts mowing time by up to 15% (v. PRO 26). The legendary power, performance and durability of Briggs & Stratton® engines make them the obvious choice for our Walk-Behind Field and Brush Mowers. 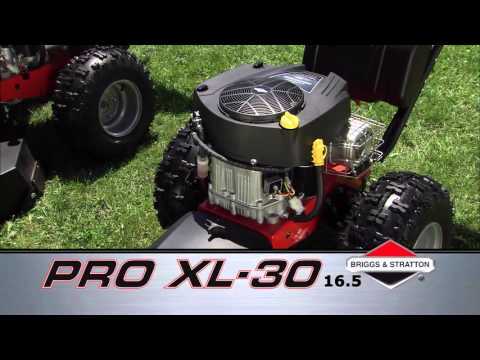 The PRO XL30 20 HP model features a Briggs Professional Series OHV twin-cylinder engine, with full-pressure oil pump (great for positive lubrication even on side slopes), a spin-off oil filter, 650 cc of displacement, (two) cast-iron cylinder sleeves, plus easy, turn-key electric-starting. Mower works great, handled the brusk and high grass on the face of a dam without problem. Only complaint is that when ordering the hour meter and heavy brush blade at the same time they don't come installed on the mower. The brush and field mower works well. Second gear is a little to speedy for me but first gear works very well. I am very satisfied thus far. This things a beast! I got the 20 hp 30” deck for my 3 acre wooded lot and love love love it. Rolling over 1” buckthorn like it mowing a lawn and 2-3” hasn’t been a problem. I’m working smarter with my DR...not harder!!! That said, if you are going to be doing thicker larger brush/saplings, it’s still a workout and takes some getting used to but it beats getting in there with a chainsaw or pruners all day long!!!! WAY FASTER!!! Did I mention, it’s AWESOME. I received my 20HP Pro XL-30 and like others have said, it is a beast. I have 100 acres and have a tractor/shredder for the open areas. This machine works great where the big stuff can't reach. Most of my heavy brush is 1-2 mesquite, agarita, sumac, and huisache and of course all the common thick grasses. The 20HP model has no trouble plowing through anything I've tried it against. However, beyond maybe 2.5 I think I'd just hit them with a chain saw. I'm very pleased with the purchase and it is well made. It's also a very good companion to my DR Trimmer Mower. Happy DR Customer! BUT, I really wish the battery had a simple plastic cover. Anyone that's worked with the push-on F1 type spade connectors for batteries knows that over time, they're prone to getting a little loose. The battery and wires are literally right next to the gasoline fill. Any spill will land right on the battery top. The first time I filled the machine, I thought I must have missed a part and double checked the shipping crate. But, that's how it's made. I'd feel better having something between open terminals and a flow of gas into the tank. Having the key in run position by mistake, a small spark from a loose battery cable terminal, and a helping of bad luck could be a very dangerous mixture. I'm not saying the machine is dangerous because of this, but it warrants a little extra care and attention. Pros: Plenty of power to cut acres of scrub oak, 1-2 bases. Plenty self propel power, easy to navigate, nice reverse gear. Climbs slopes easily. Serviceable items easily accessible. Not too loud. Good shield around blade, very little objects kicked out. Cons: No blade height adjustment, leaves 4 sharp stumps, tripping hazard, hard on horse's hoofs. Fuel tank could be a little larger volume capacity. Have only used 4 hrs operation so far. Bought optional heavy duty blade, however the standard blade is holding up well. Wish I had purchased one years ago, however, it is a little pricey. I used this to clear ATV trails and hunting areas for about 3 hours. Worked like a charm with zero stalls. 3 thick saplings were no issue. I bought one in 1995 work it hard for 23years .the 2018 model is the best.lot of improvement have been made over 23 years. super job. I have the Pro XL-30, 20 HP. I've used it for approx. 10 hrs. and it's a hoss. Nothing slows it down but it's heavy and it's a workout wrestling it around when you need to lift the cutter. I've had zero problems with it but I'm concerned about the quality control - at least on the shipping end. The cutter deck was not strapped the way the manual showed and as a result it broke loose in shipment causing cosmetic damage to the front bar from chafing against something. Also, one valve stem cap was missing. No big deal, but it does reflect on the quality control process. Well, I got my mower and all I can say is WOW. The shipping was very fast. Setup and break in was simple. Then came the test. I bought this to help on the 100 acre farm. I needed something to get close to fence lines and creeks bank. This thing is a beast. Plenty of power and power steering is great. It handles everything in its path. I have looked at this mower for a long time. I was hesitant to move forward even though the reviews were great. I finally decided to purchase the mower and I am glad I did. It is the perfect tool to compliment my tractor and bush hog. I wish I bought this when I first saw them. So, just stop the paralysis by analysis, and buy it. You wont be sorry. P.S. I am a very satisfied customer. This is an awesome monster! Bye,Bye nasty blackberries out of control!! Loving this machine!!! I have heavily wooded property and needed a brush mower for the trails and areas around my house. The DR brush mower got the job done cutting the small trees and saplings like butter!! The power steering really made it easy to maneuver corners and the power easily went up embankments and being I’m not a big strong person I was able to operate the mower with no problems!! Other brush mowers I rented let me exhausted and my arms/back very sore!! Highly recommend DR brush mowers and I own the DR wood chipper, pull behind tiller and all DR products are the best I’ve had!! Just thought I would give a second review since I bought mine 08/16. Very good mower for what it is designed for. No problems encountered and I bought the extended warranty on mine. I also ordered the weed eater attachment due to the amount of rocks I have in pastures. It works really well on 2-3' tall grass and small newly grown gum trees and dog fennel. Overall, it's the best mower money can buy. Great engine and engineering design of the mower. I hope to see a future power wagon attachment... it would be simple to design. Great product !! I purchased the xl-30, 20 hp 18 months ago and have used it extensively on my whitetail ranch for brush cutting around fences, pens, blinds, and feeders. It is a workhorse. Heavy duty blades help. Sea foam fuel detergent helps keep the float valve in the carburetor from seizing. Treat all your 10 ethanol gas with this detergent. I just ordered my second machine. If this can pulverize Texas thorny brush up to 3”, it can work well anywhere. This mower is Awesome! Does everything I had hoped it would. Making my overgrown property look great! The brush mower has really been a good addition to my equipment to maintain and clear brush from our twenty acres. It has preformed well cutting Russian Olive, young Cherry, tall grass over rough terrain and side hills. This machine has done everything I have expected of it so far. The turning brakes are a great help in making turns and taking the work out of keeping the machine on track. The only thing I wish it had is a towable riding platform to stand on. This would help greatly in saving the legs and hips. First I want to point out two issues that I had: 1) the mower crate was not labeled and yellow freight lost it. I had to call yellow freight and country home twice each to finally get the crate located. 2) the oil filter is supposed to be hand tightened, but the filter was put on way to tight in the factory. That being said this is quite a machine. We have 100 acres of pine timber in East Texas, and I had come real close to buying a tractor. So glad I went with the 20 hp pro xl 30. I was able to clear some very thick brush right up close to the pines and mow the roads and open areas. This will do the job and I’m very pleased with the brush cutter. I highly recommend it. I also bought the 42 inch grader blade. It doesn’t seem to take much of a bite on existing roadways. I can see where it would work on snow and lighter materials. Think it would benefit from a more pronounced bottom blade lip that was only 30 inches wide. I need to use it more before I give an opinion or recommendation. THIS IS ONE BRUSH MOWING MONSTER!!! CUTS, SHREDS AND CLEARS GREAT. PLENTY OF POWER AND CUTTING ABILITY. THERE ARE SOME QUESTIONABLE DESIGN PROBLEMS HOWEVER. FIRST IS THE DECK SHAPE. IF THE DECK ITSELF WENT BACK FARTHER TOWARD THE WHEELS IT WOULD PREVENT THE SMALL TREES THAT ARE BEING CUT AROUND FROM BEING FORCED INTO THE OPENING IN FRONT OF THE WHEEL. IT CAUSES LOSS OF CONTROL AS THE MACHINE TRIES TO CLIMB THE TREE YOU ARE CUTTING AROUND. SECOND IS THE SHIFTS BETWEEN GEARS IS QUITE SHORT AND IT IS HARD TO TELL WHAT GEAR IT IS IN (NOT A HUGE PROBLEM BUT ANNOYING). THIRD IS THE HANDLES. THEY AFFORD AMPLE OPPORTUNITIES TO SMASH YOUR HANDS UP AGAINST TREES OR BRUSH WHEN CUTTING AROUND SEVERAL TREES YOU WANT TO SAVE. IF THE HANDLES HAD LOOPS AROUND AROUND THE CONTROLS AND YOUR HANDS IT WOULD ELIMINATE THAT PROBLEM. MY LAST PROBLEM WAS DELIVERY. THE SALES PERSON ASSURED ME I WOULD GET IT THE WEEK AFTER I ORDERED IT. PLANS DIDN'T ALLOW ME TO BE THERE THAT WEEK. HOWEVER, IT CAME SEVERAL DAYS EARLY AND I HAD TO CHANGE PLANS AND BE BACK FOR DELIVERY. OVERALL I AM VERY PLEASED WITH THIS MACHINE - PRO XL0-30 HP - IT IS EVERYTHING THEY CLAIM IT TO BE. My first use I was not impressed. The cable broke after 20 minutes of use. I was more impressed with the customer service. They another cable out to me the very next day. It's running like a beast now. I'm looking for brush to mulch. The brush mower does exactly what they say it will do. It will climb uphill andcut,power down hill and cut. Back out of a tight spot. The power of the engine is awesome, steering brakes are great. Very well built. Got the mowing done in record time. For large areas over an acre and a half that is populated with weeds, I highly recommend this mower. I will be waiting to see how the snow blower attachment works this winter. I received the machine as advertised, put it together and used it for about 3 hours on some light grass on my farm to get a feel for how it handled. After the first use, I loaded it on my trailer, brought it home and when I was ready to unload it the machine would not crank. After talking to three different people at the D R customer service 800 number I had to take it to an authorized warranty repair shop. The closest one being 30 miles from where I live. The machine has been in the shop for two weeks and I have had to call the shop 3 or 4 times and they claim that they have not been able to get in touch with the D R service center to get parts. So I had to call the D R 800 number and get them to get in touch with the shop. I guess I am most dissatisfied with the repair shop I was sent to. I received the machine on August 25, used it for 3 hours one day, took it to the shop on Sept. 8 and it has been there since then. So all that to say I am not a happy satisfied customer!! Response from DR SupportHello, David. Thank you for taking the time to write a review for your Field and Brush Mower. We're sorry to see you've had a less than desirable experience to date with the service center. We have contacted them and the needed parts have been shipped. Please feel free to contact us again if this issue persists. We understand how frustrating this is and want to help in any way we can. This is an awesome piece of equipment... I only wish I had purchased it a few years ago when I first saw it online. I have used the Pro Max 34 Brush Mower to clear brush, including many two inch plus diameter oak saplings. I use the accessory lawn mowing deck to mow three and a half acres every week. The equipment has far exceeded my expectations in performing both of these tasks. Having had this machine (PRO XL-30, 20HP) for a few weeks, it is a true work horse! You will give out before it does! Have cut some really thick brush. Read the instructions and burnish in the clutch! I would really give this 4.7 Stars though thus far. A few tens taken off for; the brake caliper and cables exposed (they tried to put protective bars in front of them but vines just Wrap around then and bind them up - I don't use them much anyway), the fuel line cutoff is 'hidden' under the gas tank, it shifts hard (found bumping clutch lightly helps if it feels 'bound up'), and the oil drain tube gets pulled out of the plastic brackets (though, again, I am cutting some REALLY thick brush). But, WELL worth the money I paid and more maneuverable than a tractor. It's a Hoss! Again, as a guy I can't believe I am saying this, but read the instructions and enjoy! The test is in the long run. I have the older DR brush and field machine with the 17 horsepower Kawasaki. And it's not always how it looks when you get it out of the box it's how it functions years down the road. I have operated this machine for 10 years help several people clear their property, cleaned areas at the church. I have cleared lots of area on my own property and I have loved this machine for many long years. I have enjoyed it so long that now I'm too old to handle this machine except for grading my driveway with the push attachment. If you're thinking about buying one get it because it will definitely do a tremendous job in clear a lot of property and you can have fun doing it. I have loved this machine for 10 years go ahead and get one. I have not uncrated it yet! When I have done that and used the machine a few hours, I will send a review. Very happy with the brushmower. It was easy to assemble and I was able to put it to work immediately. I needed to clear a large area with so much brush and saplings that it was nearly impossible to walk through. The brushmower handled the job very well. I can see through my forest now and the area is completely clear. I am very pleased with this product. Waited a long time to finally pull the trigger on the biggest walk behind mower DR made. Got it set up, filled with oil and premium gas, started it up. Runs great at full throttle but won't idle worth a darn. Sounds like a dragster idling at the start line. I hope this goes away. Not happy with the detents for the transmission either. Very hard to tell what gear you are in. Sloppy! Once in gear and running full throttle, it mows great. Response from DR SupportHello Rob, thank you so much for taking the time to write a review for your Walk-Behind Field and Brush Mower. We greatly appreciate hearing feedback from our customers. We're sorry to hear that it is not idling correctly. You do have life time Technical Support with your machine and our Technicians would be happy to trouble shoot with you to see what the problem is. They can be reached at 1-800-687-6575 or through our live chat option on our web site. Again, thank you for your review. This mower has performed great. Arrived in great condition ans the little assembly needed was very easy. Looking forward to using this mower to clear several acres. Weve only used it once but it does what is touted to do. We have used our old one commercially for 15 years and still going strong. New one is a bigger machine. only complaint so far is the height of the handles. I'm 6 foot and they are a little high for me, so they are uncomfortable for my shorter guys after a length of time using it. And the only other "complaint" is that it was a 3 day nightmare tryinmg to set up credit to buy the thing. I just gotta tell everyone that is considering this piece of equipment that it is AMAZING!!! I am in the process of clearing out around 26 acres of recently planted (5 yrs) ago Long leaf pine trees and there are loblolly trees inter mixed and tall weeds and sticker bushes. This machine handles all of my needs with power to spare! Also maintenance is super easy! If there was a 10 Star rating I would give it without any hesitation! I have only had this beast about a week and it has not disappointed. It cuts through everything. I would agree with another reviewer that the hardest aspect about small tress is getting them knocked over. Once you do this it chops them up. This machine is advertised as capable of cutting three inch saplings. The only reason that it won't, is because it can't push it over. I have found nothing that it won't cut if it can get the blade over it. It will just about turn over backward trying to climb something, but it can't get the traction. It does everything I want it to do. My Pro Max-34 arrived a week later than expected but when it finally arrived I had to put it to the test. I took it out on our five acres of wooded property and started clearing some brush and saplings, what a beast. This machine idoes everything as advertised. It will lose traction in soft dirt but I just shift to reverse and it's back to business. When I bought the DR I was unsure if it was the best choice for our needs. After using it for a couple of weeks I don't know how I got along without it. When the right tool meets the right job you have a real winner. If it continues to hold up and preform like it has in the first several weeks it will be great. Works like its all in a days work. Cuts through all the weeds & brush. Glad I got it. Works better than I expected ,very rugged takes alot of abuse does a great job. Used it for around 15 Hrs already Solid machine. Worked great clearing about 5 acres of grass and saplings. The two plus inch saplings could be chopped, but was a bit difficult, so I used a chainsaw on the bigger ones. Cleared the field quickly, very pleased. Works great! I used it for the 1st time for about 4 hours and cut alot of 1.5 inch brush and tall weeds. Machine fired right up and I put it to the test. Cut down 2.5" saplings with ease! The only complaint is that the head light kit didn't come with instructions. I bought this for my hubby to use on our new very shaggy yard and it performed even better than expected! the ease of not having to pull a cord to start is a god send. My wife can operate it with ease. The handles are a little high for Her, but She manages. I'm a paraplegic, and am wondering if a seat could be added "like a sulky with two wheels" and attached to the back of the mower. I am looking to make one, but if there is someone who has already invented one for this mower please let me know (rwtoms@att.net). all in all it is just what we wanted for our ranch. I give it a 5 of 5. Simply a Beast, Done right! This is the second Brush Mower my wife and I have purchased in the past 4 months. The first was the same HP but with the 30 inch deck. The original has performed so well on all varieties of tough Texas brush, we decided to buy another so we can each have one and do twice as much work as we have been on our land. At first, Lori was a bit intimidated by its power but after trying it out, she discovered just how easy it is to handle and operate. We are convinced the Brush Mower truly is a beast done right! This is an amazing machine, I am reclaiming my 9 acre field that hasn't been cut in the past 3 years. Living in rural Maine, our fields grow a lot of rocks, I can get to place's where a tractor cant even think of going! It is a work horse! I love it, getting the snow blower soon, thanks for building a great and rugged machine. This machine is unbelievable. If it can push it over it can cut it. This is a food plot making machine. The tow behind tiller with spreader is next on my list. Guys I never do reviews, I know I should but in this case, I'm going to. This is one hell of a machine. For its first day at the farm I cut one mile of trail 10 ft wide for my boys to ride down by the creek. The brush was tall over 4ft and the thorns and stickers were everywhere. Im 50 years OLD AND 300 POUNDS and I was able to make 4 passes along the trail to give the boys some riding space. That means I was able to walk that thing 4 miles in 5 hours with some water breaks, it was 90 degrees out. The motor unless I hit a stump never bogged down, I figured cutting what I was about to cut was going to take a week to 10 days. The machine is strong, no day dreaming while your operating it, but I promise you won't be disappointed. Well worth the money. Vast impovement from earlier models. Tremendous cutting power, combined with increased control, make this a great improvement over earlier models.The higher blade speeds reduces mulch considerably. This machine can tackle waist high fields and provide a clean cut so long as you place it in first gear. I owned a 15 HP Dr from 2001, and this is a tremendous improvement in every measure of comparison. Glad I went with the 20hp and not a lessor powered model. This machine is a beast! My husband said it could cut almost anything down! Cleared a wide path everywhere! Not for the weakling, but worth the extra effort! Better than any walk behind mower out there. Bought a 1.6 acre lot, overgrown with weeds and 1 1/2" saplings 7 to 8 ft. tall. Bought the Pro Max-34, 20hp, love it. Cut weeds and saplings down like they were 2" tall. Best thing is, it mulches and doesn't leave anything behind. Great investment and I highly recommend it to anyone who needs to clear land. Ran in low gear through highest parts, then 2nd gear in weeds 4' tall. Never bogged down, even in the tallest grass. This is a Beast of a machine! It will cut just about anything you put in front of it up to 3-3 1/2" in diameter. It really works well on hills especially when you lock in the differential. Could not be any happier with this product, I highly recommend it to anyone who has a brush problem. Thanks DR for a great product! Glad I have this machine it does a great job. Reliable rugged trusty beast! This Pro Max-34 20 HP machine with 34" field brush cut continuous 6-ft sage up here on 7 acres of steep rocky hills with ditches. Never choked, stalled, spun out, quit, complained. American success story! I bought the 42" mowing attachment and have mowed this 4 times already. Excellent design. I bought the snow thrower attachment and it worked great. My advice is to add broader longer skids on the snow thrower for gliding over gravel. I highly recommend the system. The top-side clutch levers came in handy when my boots got snagged by vines and the machine did not drag me through them. Good safety feature. We are using the Field and Brush Mower (FBM)to clear brush in areas that had been previously been cut over and allowed to regrow. The results are amazing. Next on our list are the river cane and other tough underbrush. It would take me weeks at least to do half the work that the FBM allows us to accomplish in hours. This product is everything that they say about it. I have used it several times since receiving it and it performs as expected and then some. I would recommend this product to a friend. After using my old field and brush mower for 16 years, getting used to the drive lever being on the top of the right handle took some getting used to. Also, the power steering can be overly responsive if you grip the brake lever too tightly. Wish there were another speed between 1 and 2, as 2 can be too fast at full throttle, which is needed to maintain max blade speed. Speed 1, even at full throttle, can be too slow. The mower will bog down in heavy wet grass, but not a problem as long as you allow the deck to be raised and purge itself of cut material periodically. The handle is adjustable, but only a high or low position. That said, I am very happy with this mower, would recommend it highly. I purchased the Pro Max-34 and have already cleared over half of my field. It has performed as stated and I am very happy with it. It is a lot of work no matter how you slice it, but it is getting the job done. My only concern is the wiring around and about the DR Field and Brush Mower... It can be caught by brush as it is exposed. Other than that I have no concerns or issues.....Great product! I have only used it once so far, for about three hours. I am using the 42" lawn deck to mow approx. 1.5 acres of lawn. My initial impression is GREAT! Plenty of power, and a very nice cut. I have been using a 16 HP DR mower with the 48" deck and always had problems with the deck getting clogged with wet grass. This deck does not clog, discharging grass very well. And the anti-scalping castors really work. I preferred the previous style of wheel clutch where you pull up to engage - I found it easier to feather the clutch when working in tight spots, but I will probably get used to the new one in time. It is a bit of guesswork to find which forward gear you are in - could use some sort of detent for the different gears. I look forward to using the brush deck on some really tall grass this spring. What a beast! Handles everything with ease:Brush, weeds and trees! Anything it can push over, it chops up. It is very easy to control. One complaint. On a machine costing $3500., the hour meter should be included! Easy to order, shipped in a timely manner, professionally packaged, great price, works better than advertised with outstanding technical and customer support. This is a must-have piece of equipment for anyone serious about clearing or maintaining their property. DR Brushmower, 20 hp 30"
This mower is underpowered for mowing down brush (willows, dogwood, alder) in Montana creek bottoms. Will keep working with it but so far not real impressed. The electric start is nice, brakes need adjusting, has trouble climbing an embankment with snow on it, no biggie. Response from DR SupportThank you for taking the time to provide feedback on the DR Field and Brush Mower. We are very surprised that your experience to date is indicating that the machine seems under powered. We are going to have someone from our tech support department give you a call because this machine is perfect for the brush as described in your review and is normally a "beast" as described by many other owners. If the machine is being used in snow and on sloping ground, it would be best for you to consider using tire chains. We have them available and you can certainly discuss this with the Tech Representative when they call you. We want you to be fully satisfied with the performance of the machine and we'll work with you to ensure that you are. Thank you for your business and for choosing DR Power! i had to do a few adjustments to the hand brakes and it had paint from battery cable to handle bar causing the unit to not start. After all this , I love the new redesign dr brushmowers, its wider stance and does great on the side of the hills and while going up the hills if one wheel starts to spin just squeeze the individual brake lever to the wheel spinning one and power to the opposite wheel makes the unit go. I like the 34deck and 20hp does the job. I used this mower to clean up 1/2 acre lot. It mower through the brush and grass with ease. Great investment. This machine performs as advertised, and then some. This is my second DR Field and Brush mower, and they just keep getting better. It will easily mow marsh grass that's over my head, and go through 2 1/2"~3" saplings without slowing down. It's solidly built, and can take most anything you throw at it. I HIGHLY recommend this machine. This thing is amazing it will cut through standing or matted grass and vines like they are nothing. Saplings or small trees disappear in seconds, anything that it can climb or push over gets cut, chopped, or mulched. I have had a DR chipper for years so I was prepared for a quality product, but I was blown away by how massive it is; it's huge (530 #) but it runs quieter than a mower. Excellent product as advertised !!! The Dr Field & brush exceeds expectations. Great product! This morning while I was looking at the new DR mailer my wife asked me if I would have kept my DR mower (20H.P.w/30" deck) if I'd have done the 6-month free trial. My answer was "Without a doubt". I've wanted one for years and now that I have one, I love it. The only thing that has been difficult to mow is thick hay. On everything else it has been terrific! It is truly a greatproduct. After reading the 8 pages of reviews I decided to write one. I've had my 18hp machine for about 4 years and have had virtually no problems with it. It is a truly awesome powerhouse. My first eye-opener was when I was cutting through some very overgrown brush at the back end of my property on a steep hill. The area was so overgrown that I went through the break in the stone wall separating me from my neighbor's property. When I finally realized what I had done, I looked up at the hill and just prayed that the machine would be able to make it back up the hill. The thing virtually PULLED me up the hill (covered with berry bushes) so fast that I had to stop it halfway up to catch my breath! Then it went right over a low portion of the stone wall! This was in upstate NY. I had to get the 26" deck because in some areas the trees are too close together for the big deck. Some of the terrain is very rough, but it never stops my "Willie Wonka Tinker Tonka Toy!" It just goes over everything. Occasionally, a wet log will cause it to spin wheels, but only if it is a big log. The deck comes off easily which is a big plus for me as I ferry it back and forth between upstate NY and my other property in middle Georgia. I have also bought the chipper attachment and the big earth and snow moving blade. The chipper is disappointing but the blade works just fine. In Georgia I have some property that is even rougher than in NY, but it's not a problem for this machine. Saplings get destroyed. We have tons of vines on the ground (after I've cut down a bunch of trees that were held together by the vines), and these get nicely mulched by the DR so that I can remove the trees. My only serious complaint is with the guard/runner on the discharge side of the mower. It got caught and bent so frequently during reversing operations that I had to have it welded to the deck so that brush and branches could not snag it. DR says that doing this interferes with the discharge, but I have not found this to be a problem, even through severe operations. I have to disagree with those reviewers who found the handles too low and who found that it took a lot of strength to operate. I'm 6'3" and 68 years old and find the handles are just fine. With a little bit of practice and the proper technique, it is not a physically challenging machine. Even in heavy brush, I can pivot the machine to do a U-turn with just one hand on the machine, if I lean down a bit to get the deck in the air. My 48-year old neighbor who has a ton of strength more that I ever had, finds the machine too much of a challenge. It's all in the technique. Response from DR SupportThank you for your review Sir. We appreciate hearing from all of our customers! We're especially fond of the "monster" as well. Everyone at DR Power says Thanks! I've previously emailed DR with these problems. Within the first few weeks, the rubber flap got pulled between the chain and drive gear. It locked up the chain, which caused the transmission sprocket to snap off. I never got an answer from DR on why there isn't a 'shear key' that would protect the transmission. DR was very good at sending a replacement transmission, however, I knew at the beginning the shifting lever was a bit stiff. A few days into using the 'new' transmission, the shifting locked up into neutral. Now the repair shop is waiting for a second transmission. I've got a much older DR and never encountered these problems. Question: Are critical transmission components made off shore? If so, it would explain a lot. Response from DR SupportThank you for your review feedback. We feel that it is very important to learn from our customer's experiences. We've submitted a request for a technical support representative to give you a call. Please don't ever hesitate to contact us at 1-800-376-9637 should you have any other operational concerns. We appreciate your business. Very pleased with the machine. It does every thing they said it would do. Safe and easy to operate. Prefect for clearing barb wire fence lines.my second brush mower I have purchased this year.the the first brush mower was a 17hp I bought in 2007.easy to maintain holds up hard work. Not a durable machine, bring your tools! I bought the 20 HP with the wide cutting width to clear my property. My property is an hour drive from my house so when I took the machine over there I planned to get in a days work. No such thing with all the breakdowns. A combination of the new 20 horse engine with no protection from brush in front, the lack of protection for the wiring underneath and durability of parts. I have used it 3 times so far and have gotten very good at remounting the belt since it comes off frequently, I can also re-attach the emission hose on the front of the engine that comes off whenever you get in thick grass quickly after lots of experience doing it. I also had to fix wires underneath that are not protected and got torn when I tried to cut brush, replace a blade engagement switch that broke the first time I used it, find and re- attach wires in the front that fell off when I went through some thick grass, replace an emission plug on the gas tank and have a tire remounted. Yes all that and still not a full days work out of the machine. When you call the service line they are very helpful and send parts very quickly. The machine will cut tall grass as long as it is not so thick that it brushes against the engine, it will not work well on brush unless it is very thin. Look at the videos they show and you will see they mow grass with little or no brush. If you have tall grass to mow this machine will work but do not think you will mow anything more than that. If you do buy one, save the pallet for the return. I have until next month to return mine, I just hope to get one days use in to help make it worth the shipping costs. Perhaps a different model might be better, the 20 horse has no protection for the engine so if you try to get into anything thick wires and hoses are exposed. It needs some protection in front of the engine. Response from DR SupportWe’re sorry that the Field & Brush Mower didn’t work out for you. We do appreciate you posting about it though! We have come out with a Debris Guard for this engine since your purchase. The Clutch wiring hasn’t been an issue in the past & has been routed the same way since we came out with the AT3 models in 2005. Perhaps the brush you were cutting was very dense & “grabby”? This could also explain the belt coming off. The switch & wheel issues are not typical, but we’re sorry they happened just the same. We do test our products in many different situations, but can’t get them all. It’s input like this that helps us build a better product! We hope that this instance hasn’t turned you away from considering us in the future. We welcome the opportunity to earn your trust again. Response from DR SupportThank you for taking the time to post a review. We apologize for the inconvenience you have encountered with your Field & Brush Mower. As it was a demo model, it had gas in the system that apparently gunked up the carburetor. Hopefully the carb cleaning has cured the issue. We will be sure to bring your this issue to the attention of our maintenance shop to help avoid similar issues in the future. We will give you a call to follow up on this. Not to be a downer but after $4500 for the Pro-XL plus finish mower, I am 5 calls in with DR and 4 with my local service shop. The mower came with a faulty engine that conked out after 5 minutes (mechanic believed it was a valve), and the brake spring would not work such that whenever you brake you have to reach down and pull the cord at bottom in order to release it. before I learned that, it made for quite a time getting the 500lb machine off my pickup truck. Not fun either pushing 500lb up a hill after the engine broke 5min in. Also parts missing for finish mower in the package sent. some advice with customer service - use the live chat function. Customer service was not poor, though sometimes I gave up after 20 minutes on calls. They offered a free extra blade after I suggested that one month in the shop in midsummer for my mower was not what I signed up for. all in all, product has been in the shop about a month now and brake waiting on a part. Grass is now rather long but I have paid some folks to cut it on some properties. So far, I feel as though I bought a sears or home depot product. Response from DR SupportWe're sorry for the issues you've had. Hopefully with the new engine & brake cable it is now working properly & you are cutting your own grass! We pride ourselves on our Customer Service & feel that it is just as important as a sale. If a customer does have an issue with a product of ours, we will work as quickly as possible to get them up and going. Call volume throughout the summer months can get crazy and cause the phone lines to get backed up. We appreciate the patience our customers exhibit when this happens. Live chat is a great option but for security reasons we cannot take payment information. It’s best used as a question & answer/troubleshooting option. We can help get part #’s & verify information, but you would still need to call in to place an order that requires payment. Thank you for leaving a review. We will get in touch with you to see how your DR Field and Brush Mower is working for you. Received mower at a shipping drop off point; was not there when it was delivered. No protective padding, handles were sticking out of the cardboard box, paint rubbed off of frame and mower head. Would not have accepted it if I had been there when the truck dropped it off. DR not Done Right! Response from DR SupportWe’re sorry your order had shipping damage. We have contacted the shipper about it. Thank you for letting us know about it! We appreciate information like this so we can learn if something needs re-evaluating in our processes. We will give you a call to see how the Brush Mower is working out for you. I have the 17hp pro model. It does every thing as advertised and more. I have cut hidden stumps up to at least 5", barbed wire fence and large sandstone rocks. All of these were hidden in the tall grass and unintentional, but have had no problems. These did stall the motor though. I have had my machine for about 8 years and around year 6 the choke was sticking open. This is the only mechanical problem I have had. I do have one complaint and that is the handles are a little low for me. I am only 5'9 hardly tall. Delivers on its promise, The 18 HP engine is powerful enough for any job I will need done. It is a handful to handle. This machine is a good tough piece of equipment. I found it easy to put the deck on and get running.I did have some problems the clutch cable broke after useing for only 6 hours and the batttery was bad it would not hold charge.Dr replaced both in just a few days. I think they need to do a better job of checking out the machines before they leave the plant.They are just a little more exspensive than they should be. DID WELL BEYOND MY EXPECTATION. I HAD ACRES OF 5-8 FOOT TALL BRIERS, WEEDS,BLACK BERRYS, AND TANGLED VINES THEN MIX IN SAPPLINGS TO 3.5 INCH THAT LOCAL BUSH HOGGERS WOULDNT BOTHER WITH. BUT WITH THE HEAVY DUTY BLADE THE DR. ATE IT UP. I HAVE A VERY HILLY PROPERTY AND THE ONLY THINGS ID CHANGE IS TO GIVE IT POWERED TURNING AND AN ADJUSTABLE BLADE HEIGHT. ALSO THE MACHINE DID NOT COME WITH OIL AND I HAD TO LUBE THE GREASE FITTINGS. OVERALL ITS A GREAT INVESTMENT THAT I HAD TO HAVE. I bought the machine to cut trails in some heavy brush in northern Wisconsin. My 70 acres was logged off about 8 years ago and is heavily grown over with vegitation, popple and ash trees. Wasn't sure if this would work but some people who used them advised it would. In about 4 hours I cut about 3/4 mile of trail about 90" wide. I was amazed at the job it did. Basically, if you can run the tree over with the machine it will cut it. The trees I cut ranged from about 1" to 3" in diameter. The motor never hesitated. The 18.5 HP Pro XL brush Cutter, with it's heavy gauge, welded steel construction is powerful, sturdy and does not hesitate to dig right into thick brush, grass, vines, briars and saplings. The Kawasaki engine starts quickly, runs smooth and does not even seem to be under a load when destroying brush over 6-feet high. A great product. This was a big purchase for my family but just moving to a new property we found that we needed a brush mower for the area beyond our lawn. I have also seen the DR products on TV but finally decided to check them out and found they offered even more benefits then I realized. What made the final decision to purchase this product was the ability to have multiple attachments. I not only needed a new larger lawn mower but also a brush mower and a snow removal unit as well. With all of these available with the DR F&B Mower, I purchased it along with each of the attachments. After using it for several hours here are my thoughts. Its very well built, probably one of the best built products I have found. The engine is great, the deck is very good and the power unit is also solid and well built. The unit is heavy and gives a good workout to operate, it really does mow down about anything you can throw at it within reason, even the heavy sage brush in my back yard. I do like the belt drive portion that way if you do hit something that is solid it will at worst break the belt and at best make the belt slip. A couple of things to consider and maybe design modifications that would help are: 1) there needs to be a slight gear change to make 2 through 4 just a bit faster, 2) for this model, I would expect there to be the hour meter included, not just an aftermarket add-on. Overall, I'm very happy with the purchase and think this product will last me a long time, I really enjoy having one power unit to do almost all of my yard tasks. Using it has been easy and exceeded my expectations. I recommend this product over the others who is considering a brush mower. We like the product so much we are now on our third. We have 5 rural acres that gets flooded at times and when we can't mow it gets overgrown. The DR knocks it down like a champ every time. My only complaint is that the front skids are now bolted on instead of welded....I imagine they are not going to be as rugged and that I will eventually have to weld them on. Otherwise....a great product that performs like nothing else in its price class! I wish I could lower the deck other than that works great. Easy to use and tough. This is my second DR. It was at least a dozen or so years ago I bought the first one. I bought this latest one because I just worked the life out of the first one. The new machine was very easy to put together and installing the belt was a great improvement over the first machine. This new machine is a beast and should last a very long time. Packaging and delivery excellent. Assembly was less than 10 minutes. On our 90 acres need to clear about 20 acres. In first 2hours cleared about 1/2 acre of worst stuff, 3 in saplings, briar, vines and 6 ft tall over growth with ease. Easy to get into areas where bush hog can't. Will post back when have more weeks of use logged. I have had my machine for about 9 years and have used it to clear 2" to 4" sapplings. It has never failed to cut down and mulch anything I have put it on. It is everything that it is said to be. I just wish it had a deck to ride on. I recently purchased a new 18.5 HP Pro-XL DR Field & Brush Mower Elec Start, 30in Deck to mow thick grass and brush in areas I could not reach with my tractor and bush hog. Due to the extensive rainfall we have received this year, I could not access a large part of my property with my tractor. The 18.5 HP Pro-XL DR Field and Brush Mower has exceeded my expectations: It is easy to start, it has plenty of power when mowing thick grass, the 4 speed transmission allows the user to select the proper speed for the job, the machine is easy to manuver through the woods. I am glad I purchased the DR machine instead of some of the others I have seen. What a machine ! I've got 220 acres in northern Maine and really overgrown, but, cleared around outbuildings and a long access road about 3acres in all . Did it in no time with little effort only walking behind it . This monster eats what you put in front of it. I'm well satisfied with it . We have an older model and the deck is heavier gauge steel. Nice product. Just need to increase the deck thickness to the original specs. We have been impressed with the durability and quality of the machine. We have put it into some pretty rough places and it has handled every situation well. The only drawback to it is when you get it on a bank. It becomes difficult to manage and can only be used on banks up to a certain point before it becomes unsafe to the operator. Mower is good, but could use more power. I have noticed a squeak like it is in the wheel bearing. This has been going on since the second time I used it. I feel it is overpriced. You would think for the amount of money this machine cost it could come with an hour meter on it. If you find something this thing can't mow over, give me a call because mine will !! I work for someone who owns this machine and is now selling his business and will pass this on to me because I liked using it so much. I have mowed saplings as big as 3" with this and had no issues. I have hit stone walls going through the woods and was able to navigate my way over it with no damage to the mower. Does everything I want and MORE! I live in Western Washington state. Here we deal with Himalayan black berry bushes, which, if left unchecked, can grow to more than 10 feet tall and be so thick a machete is insufficient. I have five acres and dealt with these bushes for years, then purchased a DR Field and Brush mower. WOW, it just walks through these bushes. Within a few hours I cleared about 1.5 acres of them. In the middle were Alder tree saplings, about 2 inches in diameter. Took them out too. What I liked best is the DR just leaves behind mulch. I have been mowing this area now for the last 3 years and the black berries are almost completely gone. MY DR is 5 years old now and I use it a lot. Even hiring it out to help my neighbors and friends. After all this time the only thing that I have had to do is change the oil and sharpen the 30 inch blade. Thanks for QUALITY product. I purchased the PRO XL to "mini hog" tight spots on my 12 acres and to maintain my 2 acre cabin property. I only mow my cabin property two times per year. The mini hog tackles six foot grass and saplings easily. The property is sloped and I have never had any power or traction problems. The locable hub is handly there. On my 12 acres I have about two acres of tight areas and it gets in the trees easily. The back of the property is too wet for the tractor but my Mini Hog glides pretty good and hasn't gotten stuck. In short this product is very very good. I also bought the mower deck I like it and it does what I need but it has short comings. Read my review. on it. Have owned the 17HP Kawasaki model for 6 years on a 40 acre rocky, hilly piece of land in the ozarks......This bad boy will take down 2 to 3 inch hickory saplings and keep trucking. Weeds and underbrush have no chance. The only real limit is YOU, not the machine. Following this dude thru and over hilly, uneven ground is a challenge, but thats the beauty of it, it goes where a tractor or full size brush hog can't. Beautiful. My complaints are really only additions, put a backup rope pull on the engine, a cupholder on the handlebars ......... and put hand guards on the handle bar levers. For the oldtimers here its like enduro motorcycles used to have, they keep your hands from getting blasted, cut and bruised by the brush you are bulldozing through. Build quality is great, have had zero issues in 6 years of use. Rock an roll ! I recently bought a used l5 hp DR walk behind mower and just last week I put it to use on steep, overgrown terrain covered with Locust saplings and tall grass in North Carolina. Having never used a DR product before I did not know what to expect..........but whatever I could have expected the machine exceeded everything. It was just fantastic to be able to point the machine and go. It never bogged down......it cut everything in it's path.....it is truly the right machine for the task and I could not be happier with it. It was so well balanced it made dealing with the slopes easy to deal with even though I'm only 5' 4" and 70 years old.. The field I cut had been a problem for years, too steep for a tractor brush hog, too tough for a weed eater...the DR mower was incredible. I felt that when I pointed it toward a clump of tall Locust saplings it not only said: "ok let's go" I swear it said: "Hold on!" I cannot recommend the product enough. I have never sent a testimonial for a tool before this one and couldn't wait to do so because I enjoy the machine so much. This machine has taken everything that I have thrown at it. Sumac up to 3", manzanita, sagebrush, chaparral. I had the 10.5 hp Briggs and Stratton for a lot of years and was impressed with that machine. The 18.5 HP Kawasaki machine blows me away with the power. The only compaint I have is the muffler spark arrester set up for the Kawasaki engine gets hung up on brush and gets knocked off. Poor design. Sticks out too far. Have used for several years. No maintenance problems. Used primarily on tall thick grass, some small sapplings. A little difficult to handle in small areas because of it's size. Transmission speed options fit all situations I have encountered and add to proficiency. Handling difficulty increases on sloped areas, hard to keep traction with upper wheel when mowing with the slope. Plenty of power to climb slopes. Lower transmission settings good for mowing downhill. This size of this machine requires good physical stamia, won't need to got to gym after a few hours of use. Great product, i will never use anything else again. very good piece of equipment. i have had some workers try to run this erquipment up a tree thats how great it is. I've had the 17 hp, 30" deck, now for several years and it is all DR advertised it to be. I was a doubter since I needed something that was nearly indestructible for the place I have got here in northeast Okla., called brushy mountain area and it is appropriately named. This machine is the greatest to get the job done and keep on running. I've had it in places I could hardly believe it would go. My husband and I are both senior citizens, we love our DR Field and Brush mower, we have 50 acres, mostly woods, it helps keep the saplings from taking over our yard which we try to keep at least 15 acres around the house clear. We have a pond in the backyard and it helps us keep areas around it clear too. Theis product performs as advertised. The only problem I have with it is the height of the handles. A model made for users over 6 feet would be great. Q.I have a lot of low cut stumps in the field I'm working on. Is there a shear pin or some other device to prevent damage to the machine if operating and the blade hits one of these large stumps? The blade is belt driven which helps reduce the impact when hitting a stump, rock, etc.. The custom made blade spindle shrugs off high impact. The blade spindle is made of solid steel and is integrated into deck housing. There are no shear pins on the machine. Q.I have 20 acres of brush (primarily Buckthorn) to clear. Most of it is 2.5 inches in diameter or less. Would the 16.5 hp or the 20 hp model be the best choice? We would recommend the 20 hp Field and Brush Mower for doing 20 acres of saplings. The 20 hp model is a V-Twin engine and can handle up to 3 inch diameter saplings. I will also recommend the standard 26 inch deck for doing that type of mowing. Q.Is there a battery on this unit? A.The electric-starting Field and Brush Mower batteries are sealed and completely maintenance-free. The 12 Volt 17 Amp battery is 7"L x 3"W x 6-1/2"H.
If you operate the mower engine for at least 45 minutes, it will maintain proper battery charge. If the battery loses its charge, you'll need to use a trickle charger to recharge it. A.All Walk-Behind Field and Brush Mowers have a fixed cutting height of approximately 4" high. This is high enough to clear most low stumps, roots, etc., but also close enough to keep stubble short for easy walking over cleared areas. For larger areas that need to be cleared, our 44" Tow-Behind Brush Cutter is going to do it with precision. With 3 models to choose from, you will be able to power through saplings from 1" up to 2" and head high grass. This model features a step and mow height adjustment. Just choose your mowing height, from 4" to 7-1/2" with an easy foot-activated adjustment system. Thanks for your interest in the DR Mowers! Q.I have a large bamboo thicket that is taking over my property. Will this brush mower handle bamboo and mow it flush to the ground? A.Our Self-Propelled Field and Brush mowers feature a standard cutting height of 4". Whether or not it can cut the bamboo depends on the thickness of the stalks. Each mower has it's own specific cutting capacity. The 20 HP model can cut up to 6' high grass, 8' high weeds and 3" thick saplings. If the bamboo is within 3" thick, the deck of the mower can push the vegetation over and cut it. These are very powerful machines. Q.I have many small red oaks and sweet gum that are 3" to 3.5" thick. Will the large brush mower cut down the red oak saplings ? A.Our Pro-XL walk behind Field and Brush mower is capable of cutting high grass up to 6', 8' high weeds and saplings up to 3" in diameter. Anything larger may not provide you with the optimum performance of the machine. You could also risk damaging the unit. For the 3.5" saplings we would recommend considering cutting them by hand and using the mower on the 3" and under saplings. The Field and Brush mower is a great piece of equipment for helping clear property. Q.What are the dimensions of the shipping crate? The shipping dimensions for the 20 HP Pro XL Walk Behind Field and Brush Mower are 55"L x 46"W x 46"H and weighs 463 lbs. Q.I am tall (6'4"). Can I raise the handlebars so I don't have to bend over to operate the machine? Unfortunately, the handle bar height is not adjustable on the DR Walk Behind Field and Brush Mowers. Q.I have several acres of sage brush with heights up to 24" and stems at 2". I have a tractor mounted cutter for the field, but need a smaller unit for tighter areas. Am considering the 20 HP SKU: FBM200EN. Will this handle the job? The 20 hp Walk Behind DR Field and Brush Mower will handle the sage brush very well. It will handle up to 6 ft tall grass, 8 ft tall weeds and 3 inch diameter saplings. Q.When was the Dr. Field & Brush mower first manufactured, the self propelled, 20 HP Electric start, Pro-XL Model? A.Our 20 HP model was introduced in 2014. Previously our largest model we offered, self propelled, was the 18.5 HP. Our Pro-XL model now features a Briggs & Stratton engine. It is capable of accepting all of the Field and Brush mower attachments. Q.1)How well will this machine climb a steep hill and mow tall grass at the same time? Of course mowing in dry conditions would be most probable. 2) How well does this machine deal with rocks and outcroppings in tall grass? Sometimes you just don't see everything you would like to! A.Thank you for your questions. We do not recommend using any of our machines on hills steeper than a 20 degree slope. It can mow up to 6' High Grass, 8' High Weeds, and 3" Thick Saplings. Since the Field and Brush Mower is belt driven, it can be used in areas that are rocky, rough and overgrown. When the unit comes in contact with a solid object such as a rock or stump, the belt will slip helping to prevent damage to the spindle.Please let us know if you have any other questions. Q.Does this clearance model have the power steering feature? Q.What tools are needed for assembly of the PRO XL-30 20.0 HP Electric-Start? A.The only tools you will need to assemble the Field and Brush Mower are a 9/16" wrench and a pair of wire cutters. Q.I have a remote property in Vermont that we vacation at. There are a few miles of trails and a 7 acre orchard, with the rest woods. How many acres/hour can the 20 HP Pro-XL cut? What are the speed ranges in MPH for cutting? A.Thank you for contacting us and your interest in the DR Walk Behind 20 HP Pro-XL Field and Brush Mower. The amount of acres per hour it will be able to cut will depend on the operator. The Walk Behind Pro-XL has a maximum speed of 3.7 mph which is a very fast pace for the operator. There is a "feather" touch control lever that gives you total control of the speed in any of the 4 forward and 1 reverse gears. The type of cutting you are doing (how tall the weeds, how steep/bumpy the property is, etc) will have a big effect as well. Q.What is the plastic plug in the dash round hole with slotfor? I believe part number is 15115. It's next to the hour meter. A.Thank you for your question. That is a port for the optional light kit. That is where you would plug it in. Please feel free to contact us if you have any other questions. Q.My application requires constant shifting between forward and reverse. How easily is this accomplished. cannot afford this to be slow and awkward. This is my biggest reservation about ordering the machine. Thanks. A.Thank you for your interest. The Field and Brush Mower is easy to shift. There are three forward gears and one reverse, with a neutral separating them. When you need to stop and reverse, it's just a matter of shifting the lever down. They are large machines, so there is a degree of "manhandling" involved. Feel free to contact us if you have any other questions. Q.Is this model power steering? A.Thank you for your interest. This is not the current model Field and Brush Mower. This will have a locking differential, but does not have the power steering. Please let us know if you have any other questions. A.Our Self-Propelled Field and Brush mowers feature 1 reverse gear. This allows you to maneuver out of tight spaces and to get the right angle while mowing. The Pro-XL model also features 4 forward gears. This our beefiest Self-Propelled model. A.Hello Joel, thank you for your question. We don't recommend using any of our machines on hills or inclines that exceed a 20° grade. This is for the safety of both you as the operator and your machine. Please feel free to contact us if you have any other questions.